'Yellow Umbrella Man' HK protest Jump to media player Paul Zimmerman, who is a Hong Kong local councillor, explains why he took a yellow umbrella to protest at a China National Day reception in Hong Kong. HK teens defy parents to protest Jump to media player Pro-democracy crowds remain on the streets of Hong Kong at the start of National Day - which activists hope will see the largest protests so far. Defiant HK protests on National Day Jump to media player Pro-democracy crowds remain on the streets of Hong Kong at the start of National Day, which activists hope will see the largest protests so far. China 'will safeguard Hong Kong' Jump to media player Chinese President Xi Jinping has said his country will safeguard Hong Kong's prosperity and stability, amidst growing unrest in the territory. Drone captures Hong Kong protest Jump to media player Footage filmed by a drone captures the scale of Saturday's pro-democracy protests in Hong Kong's central business district. 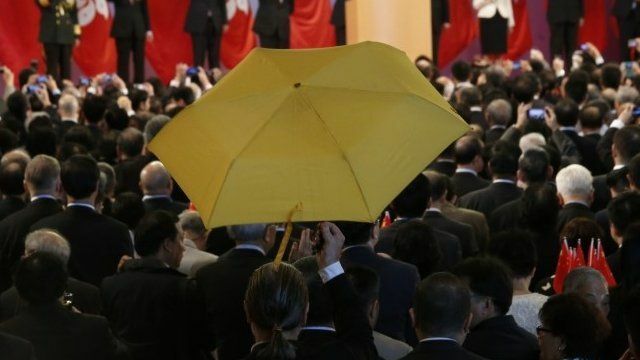 Paul Zimmerman, who is a Hong Kong local councillor, explains why he took a yellow umbrella to protest at a China National Day reception in Hong Kong. Thousands have joined pro-democracy protests in central Hong Kong, as they spread on China's 65th National Day. The protesters want China to withdraw plans to vet candidates for the next Hong Kong leadership election in 2017. Mr Zimmerman said he was concerned about what the security at the reception would do when he raised his yellow umbrella, he was not removed from the event.